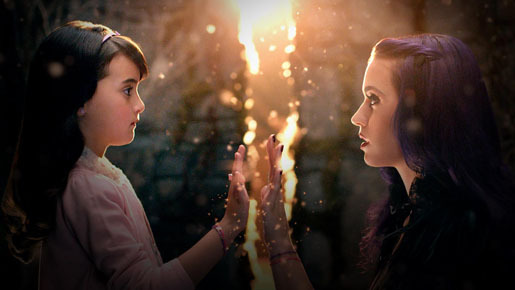 Katy Perry’s music video for “Wide Awake” is in the running for Video of the Year, Best Art Direction and Best Visual Effects at the 2012 Music Video Awards being held in Los Angeles on September 6. In the music video Katy Perry takes a magical, retrospective journey through beautiful and intense metaphorical worlds, coming to terms with the confusing mazes of her inner psyche with the help of her younger self. Filming was shot by director Tony T Datis via DNA with director of photography Stéphane Vallée, producer Dawn Rose, commissioner Danny Lockwood, stereographer Glen Macpherson, consultant for Panasonic Ray Hannisian, production designer/art director Benjamin Bamps. Editor was Jarrett Fijal at Bonch. Colorist was Dave Hussey at Company 3. Visual effects were produced at Ingenuity Engine by creative directors Grant Miller and David Lebensfeld, VFX producer Oliver Taylor, executive producer Matthew Poliquin, lead compositor Nicholas Sorenson, compositor Nicholas Daniels, lead CG artist John Martini, lighting technical director Ryan Lathey.